The feed supplement is manufactured in sachets by 2.5 g packed in carton by 10 pieces; 0.5 kg polymeric cans. Softly and rapidly stops diarrhea preventing water loss. Suitable for all types of farm and small domestic animals including rabbits and ornamental rodents. 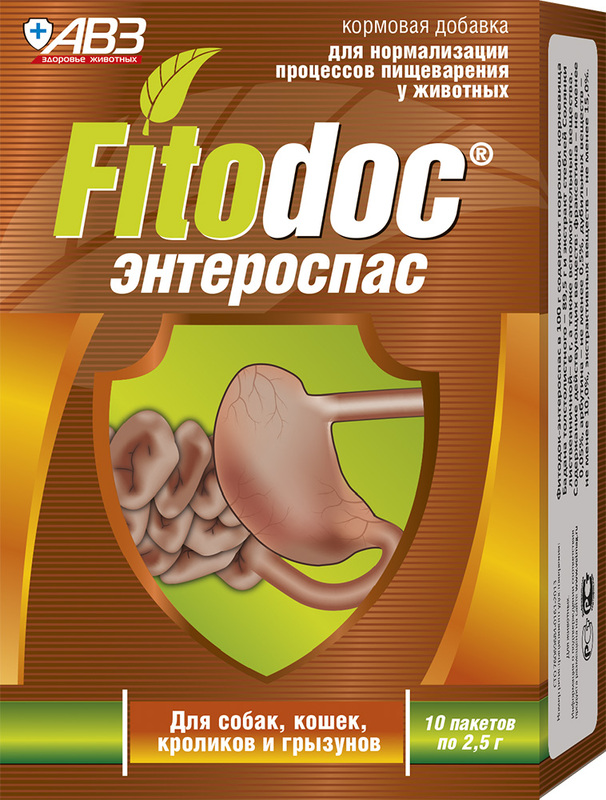 100 g of Fitodoc enterospas contain: powder of leather bergenia rootstock (Bergenia crassifolia (L.) Fritsch) - 89.5 g and larch-leaved saltwort stalk extract (Salsola laricifolia) - 6 g, as well as excipients. Leather bergenia is famous for strong antidiarrheal and antibacterial effect adsorbing enterotoxins and metabolic products. Larch-leaved saltwort stimulates tissue immunity increasing phagocytosis, normalizes microcirculation in inflammated tissues of gastrointestinal tract. Use Fitodoc enterospas feed supplement to normalize motion of the gastrointestinal tract and digestive processes in animals which includes use in combination with drugs. Administer in listed doses with feeding or water (depending on animal type) within 3-5 days. Administration frequency is twice a day, 12 hours apart. In severe cases double this dose and administer it for 3 times a day, 8 hours apart. There are no limits for use animal products administered by Fitodoc enterospas as a meal. Adverse events and complications are not observed in case of administration as per package insert. Long-term administration in increased doses may cause coprostasia. In this case stop administration of the feed supplement. 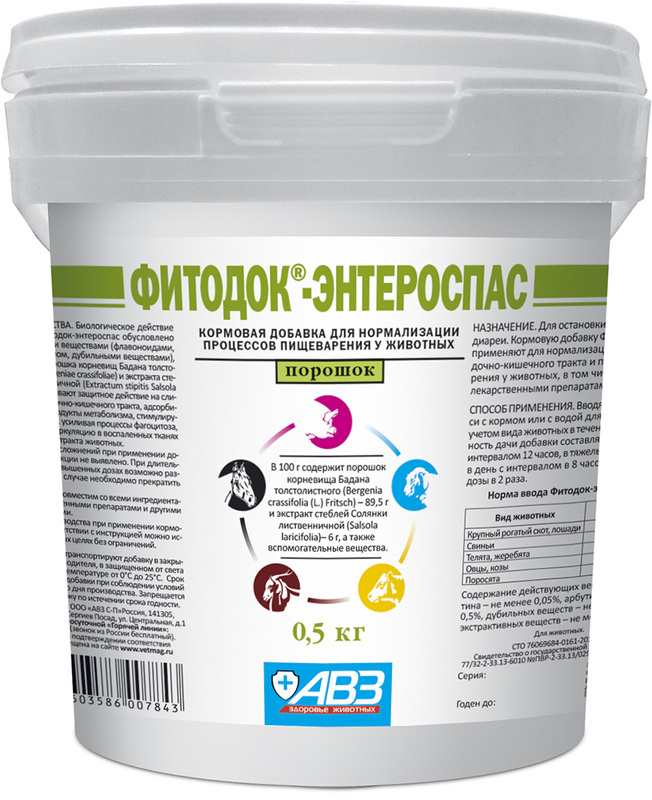 Store and ship the feed supplement in closed original package at 0-25°С. Protect from light and moisture. Shelf life is 2 years from manufacturing date.